"Working it out", an exhibit of thirty-one pieces gives sixteen artists the chance to put a slant on our work-a-day lives that we might not have seen. There are pieces that show a sense of humor or irony, that are like poetry, that have social commentary, or that celebrate pride, experience and toughness, or just existence. 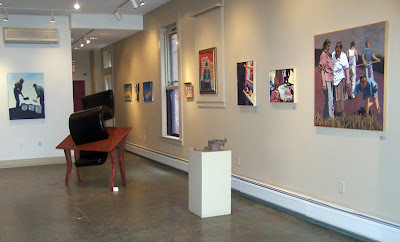 From (michael smith)'s great little painting The World Needs Ditch Diggers, Too 2008) to Jeneane Lunn's blistering colors of John Deere in Summer and Helen Rabin's pensive Figures Gardening 1998 (seen below at right), the artist is at work. Mark Heitzman's Persuader 2004, drawn in graphite on paper, is a representation of a huge wooden wrench, perhaps at full scale. The "persuader" is the tool that takes care of tough jobs. Whether this well crafted wooden item is a relic or still in use, its plain, intellectual, precise rendering only enhances its iconic presence as art. Quite in contrast, the strongly rendered figures in Heidi Broner's colorful canvases are frequently in half silhouette. 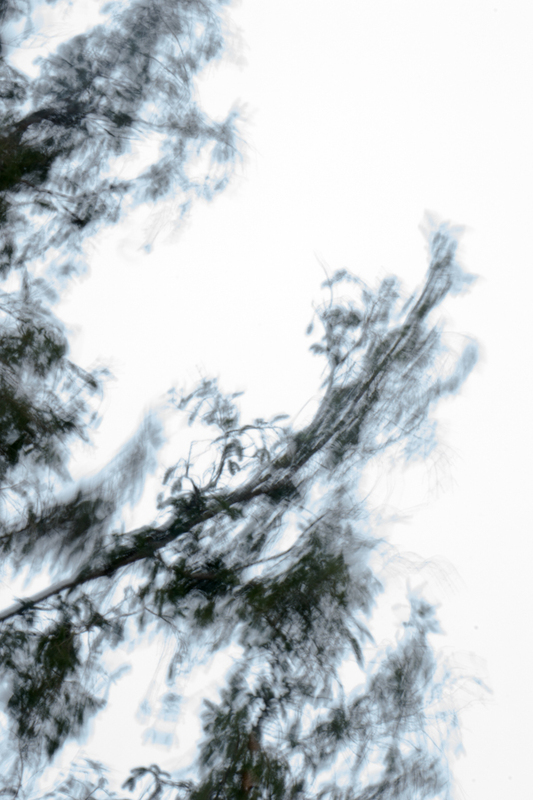 They're isolated, without sharp boundaries, against an atmospheric, misty background (Utility Pole 2009), usually blue, sometimes highly colored (Burn Site 2008). In the balance, gesture and detail of each hand and body, the people are very specific. Nevertheless, the paintings somehow speak of everyman (Spreading Cement 2006). Along one wall, photographer Jack Rowell captures the essence of work in two fine portraits and a pair of hands, then suddenly there's one of Wendy James' digital photomontage pieces Wire Workers 2008, a refreshing non sequitur to so much gritty realism. 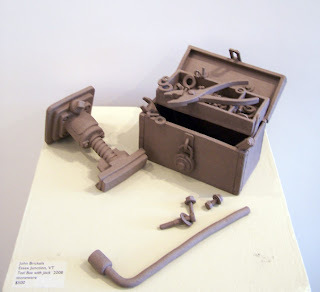 In rendering tools, robots, houses, and machines in clay, John Brickels brings his own brand of non sequitur humor to his sculpture (Tool Box with Jack 2008), while honoring his origins in the industrial rust-belt of Ohio. In Microscope 2008, Lilian Aye opens the boundaries of realism letting unrelated items stand in for each other visually. 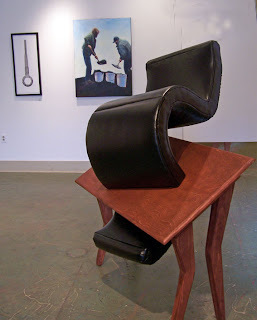 And M. Angelo Arnold, once again, wrenches familiar furniture into an unfamiliar relationship (Ponder 2009). What might have been a comfortable white-collar work station has been jammed together as by a violent tornado. It's going to take a lot of effort to get anything done now! Perhaps the scope of work was not very clear. Just table that problem for now and consider this: Robert Brunelle Jr. (Skull and Hammers 1993-2009) once wrote, "Behind each of my works lies a strange, humorous and...usually...true story!" Right: Angelo Arnold, Ponder, with Heidi Broner (Burn Site) and Mark Heitzman (Persuader) on the wall behind.